Good grilled cheese can be an absolute lifesaver. Whether it’s late at night and you’re feeling snacky, or on a weekend afternoon when the weather outside is not conducive to long walks for food. This is a list of some of my favorite grilled cheese combos for those late nights or lazy afternoons. All of them are made from ingredients at Weshop, meaning you can stock up everything you need on a Sunday and be good to go for the week. These are just combinations, so feel free to use whatever bread and cooking style you like. I’m partial to oat bread for the taste and olive oil for cooking, because it cooks slower and provides a lighter and less greasy feel to your grilled cheese. The following are vegetarian-friendly, but all you carnivores can add meat (read: bacon) wherever you think it appropriate. This is perfect late at night when it’s too cold to go out, but you still want something with a little kick. The spice of the sriracha and pepper jack pairs perfectly with the creamy cheddar and avocado, resulting in a great combination of flavors and textures. 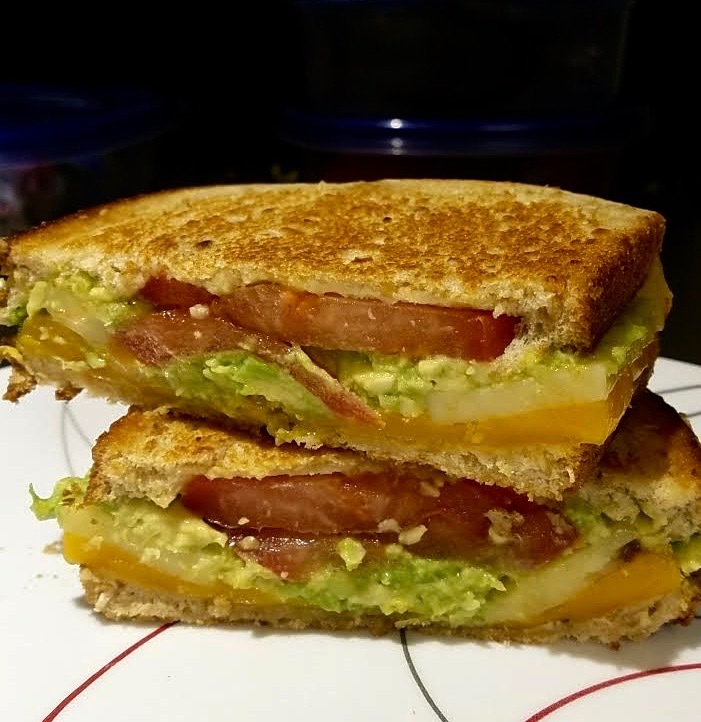 It’s best if you layer half the cheese on top and half on the bottom, allowing it to melt into the avocado for a pleasing aesthetic before you down it in four bites. The Classic Caprese is a great way to get your Whey fix even when the truck isn’t open (or is just too far away). This is the quickest and easiest on the list, great for a rushed lunch in between classes. I like to put a little balsamic on the insides of the bread, letting it cook into the sandwich and give it a nice bitterness to really bring out the taste of the basil. Feel free to make it a little more complex with the addition of spinach or some other vegetables, raw or sautéed. I know, I know. This sounds like it wouldn’t work. But it totally does! Even if it isn’t quite like actual pizza, it will definitely give you the same kind of feeling in your belly afterward. I recommend spreading a little bit of sauce on the insides of the bread and then heating up some extra on the side for dipping purposes. Some topping ideas: pepperoni, sautéed spinach and mushrooms, thinly-sliced eggplant. This one has a lot of wiggle room to experiment with. I like adding raw onion in at the end for a little crunch. There is definitely the space for some portobello mushrooms, bacon or ground beef, or anything else you want to shove in the middle of this bad boy. Be sure to leave yourself plenty of time to caramelize the onions in canola oil or butter—proper caramelizing is slow and uses low heat to really bring out the sweetness of the onions (a sweetness that plays well with a tangy barbecue sauce). I know, I know. I’m really reaching for the alliteration on this one. But it’s not just “veggie”—there are a lot of vegetables in there! I like sautéing everything in garlic and oil or a balsamic vinaigrette, then just piling on. It’s a good idea to grill the zucchini after slicing it thinly, and then to that along the bottom of the sandwich. It gives it a little bit more heft and crunch and is perfect with the swiss-mozzarella combo. The best part of these recipes is that they are really easy to double, letting you make two sandwiches quickly. This opens up a number of possibilities. Save one for later in the week! Bribe your roommate for the homemade cookies his mother sent him! Or, best of all: Make a bunch alongside your friends, and bond over cooking and melted cheese. Enjoy your upcoming grilled cheese party, and feel free to send me an invite!